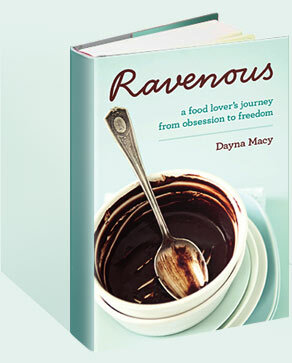 2006 December — Dayna Macy, author of "Ravenous"
I write about food, mostly for Yoga Journal. My last column in the November issue was about the health benefits of eating soup. Here’s my recipe for beet soup. It’s Solstice, the shortest days of the year. The earth becomes more quiet. It’s time to eat what digs deep, which are the root vegetables. I particularly love beets because they are so red, earthy and powerful. 1. Saute the onion in the butter or oil in a heavy 4-quart pot over medium heat until soft, about 5 minutes. 2. Add the beets. Saute for 5 more minutes. 3. Add the water or stock. Bring to a boil and skim the foam from the top. Continue cooking, covered, over medium low-heat until vegetables are soft, about a half hour. 5. Optional Puree with a hand blender if you like a smoother consistency and aren’t including cabbage or beet greens. 6. Serve hot or cold, topped with fresh or dried dill and a dollop of plain yogurt or sour cream. I thought about my own young children (seven year old twins) and how much like apple saplings I hope they are — digging deep roots and not expending energy on anything showy. Like most good things that bear fruit, it takes time, and deep roots. I often write the food column for Yoga Journal, where I work part time as their Communications Director. In the upcoming January/February issue, I invite a Zen Chef from Spirit Rock to cook with me for the day. We had a splendid time and I felt very lucky to live a life where I can interview a Zen Chef and get paid for it, let alone eat her food. For the first time, the magazine asked me for a picture for their Contributor’s page. I was not happy. I’m a writer and my words are my calling card. Now I was getting all uptight about a photo. I mean, could they erase my double chin? Turns out yes, there’s this wonderful program called Photoshop and they can do all sorts of magical things with it. I’m glad that’s over. Now I can get back to writing.